Western Australian Visitor Information Centre - Pemberton Best Western Hotel. Pemberton Pub. Pemberton Hotel. Hours: Cafe Mazz is open for breakfast, lunch and dinners 7 days and week. Closed Good Friday and Christmas Day. 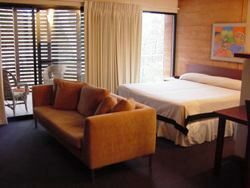 The architecturally designed Best Western Pemberton Hotel has 30 units overlooking the beauty of the karri in the heart of the Pemberton Township. A facade of rammed earth, exposed beams, local timber and modern carvings make this a true Pemberton experience; a rare treat from the surrounding south west properties. The true charm of a country pub can still be experienced at the original Pemberton Hotel, which is located adjacent to the newly designed and built modern accommodation and cafe. Our modern motel rooms have queen or king size beds, ensuites, television, tea/coffee making facilities, a small bar fridge, reverse cycle airconditioning and overhead fans.Our 2 deluxe suites with spa baths allow an abundance of natural light and private balconies that accommodate the karri views.The unique style of the cafe offers alfresco dining with a menu that is enhanced by local produce and wines. Also open for breakfast from 7.00am each morning.For the old fashioned at heart, the original Pemberton Hotel offers fantastic "pub grub" and a great bar. For the comfort and convenience of all our guests we do not allow pets in the units. The entry of the deluxe suites feature a jarrah bench top and small bar fridge. The suites have king size beds, a small private balcony, comfortable 2 seater lounge, television and DVD, reverse cycle airconditioning, a spa bath in the ensuite. The rate includes chocolates and a bottle of local wine on arrival, cooked breakfasts in the morning. 9776 1017. 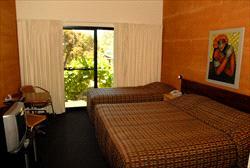 Our family rooms have 1 queen size bed and 2 single beds. All the beds are in the same room. The rooms are airconditioned and have overhead fans, TV, tea/coffee making facilities, a small fridge and ensuite. Cafe Mazz opens from 7am for Breakfast, 12noon for Lunch and 6.00pm for Dinner. 9776 1017. Rooms have 1 king size bed. Ensuites, reverse cycle airconditioning, overhead fans, tea/coffee making facilities and a small bar fridge. These are for1 or 2 persons. Cots are available at $20. Cafe Mazz is open from 7am for Breakfast, 12noon for Lunch and 6.00pm for Dinner. 9776 1017. Rooms have 1 king size bed and 1 single bed. These are for up to 3 persons. Ensuites, reverse cycle airconditioning, overhead fans, tea/coffee making facilities and a small bar fridge. Cots are available at $20. Cafe Mazz is open from 7am for Breakfast, 12noon for Lunch and 6.00pm for Dinner. 9776 1017. 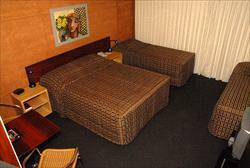 Rooms have 1 queen size bed and 1 single bed and can accommodate up to 3 persons. Ensuites, reverse cycle airconditioning, overhead fans, tea/coffee making facilities and a small bar fridge. . Cots are available at $21. Cafe Mazz is open from 7am for Breakfast, 12noon for Lunch and 6.00pm for Dinner. 9776 1017. Rooms have 3 single beds. These rooms are for up to 3 people. Ensuites, reverse cycle airconditioning, Cots are available at $20. Cafe Mazz is open from 7am for Breakfast, 12noon for Lunch and 6.00pmfor Dinner. 9776 1017. Rooms have 2 single beds. The rooms are for 1 or 2 persons. The rooms have have ensuites, reverse cycele airconditioning, overhead fans, tea/coffee making facilities and a small bar fridge. Cots are available at $20. Cafe Mazz is open from 7am for Breakfast, 12 noon for Lunch and 6.00pm for Dinner. 9776 1017. 48 hours notification of cancellation is required otherwise first nights accommodation will be charged. 72 hours notification of cancellation is required on long weekends otherwise no refund will be allowed.